Exploring book blogs is SO fun, but can get overwhelming! Did you know there are blogaversaries? I wonder when this blog should have celebrated that? There are book challenges: read so-many pages, read all of Austen’s books, read all science fiction, read all romance in February. There are Blog-Hops – what do you think that is? I think that it’s where several blogs ask the same question and want you to post comments all over? But I’m not sure. There are Three-Things Thursdays, Wordless Wednesdays, lots of giveaways and long-term big-book read-alongs. And now this weekend is the 48 hour TBR Marathon! A good idea for a cold, early February weekend when there will be LOTS of football talk on TV. A good idea to work on that TBR (to be read) pile. Friday night to Sunday night. Read read read. Blog about it. Post your TBR list. I’m not a fast reader, so I doubt much of a dent will be made in my TBR list. Especially if I keep reading book blogs! But first on my list is reading “The Summer We Read Gatsby,” which I am enjoying so far. 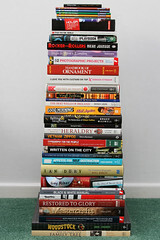 This entry was posted in About Book Blogging and tagged blogs, book club blogs, books. Bookmark the permalink. I am working on my TBR list too!!! Fun, fun, fun! How nice you found the world of book blogs. It’s a great community with lots going on. Hope you get a small dent in that TBR. Happy reading!